Second Try – Grown Up, Now What? My catastrophic cooking fails that I share here are always popular – they get more hits than my other posts. 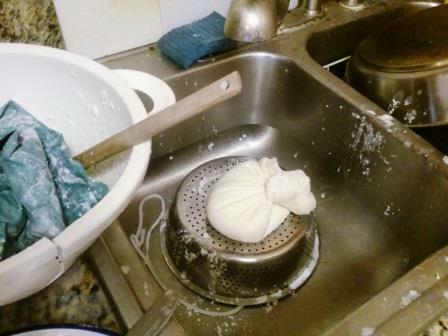 I decided to be brave and retry two of my fails: Making paneer cheese and pectin. Paneer is supposed to be the easiest of all cheeses to make. It doesn’t involve rennet, and it’s basically simply adding acid to warm milk. Leave it to me to mess it up … and make a mess. But this old dog can learn from her own mistakes. From my failed attempt last time I learned several crucial things: Make sure I have cheese cloth ready before I start; STIR the milk while it is warming up; Add salt. Knowing what I was doing made all the difference! I made cheese!!!!! A few weeks ago there was a huge sale on apples, so out came my crockpot and my canning supplies, and I made apple butter and apple sauce. My place smelled wonderful! I ran out of enthusiasm for cooking, so I simply froze up all the cores and peels. This past weekend was pectin, take two. I followed the recipe diligently. I weighed the apple bits and measured out the water appropriately. I set the timer when it started to boil and let it cook for the requisite amount of time. I strained out the solids and brought the apple “soup” back up to boil and cooked it down.Forty minutes later I started testing it. It wasn’t passing the gel test. I kept trying and it kept failing. It never worked out. This is the world’s simplest recipe, and I can’t make it work. But all was not lost. DH2U asked if I was done with my apple creation. I told him I was about to throw it out. He asked if he could have it for a marinade of turkey breast and thighs I picked up before Thanksgiving. More power to him. I felt so much better knowing all my work wasn’t going down the drain, literally. His recipe involved apple juice and red wine. Our turkey was purple! I’ve given up on pectin from scratch, but I now feel brave and will expand my cheese making skills. Watch for future posts. What was your last cooking fail? or What was the last thing you tried again after a not-so-successful first try? The purple turkey tasted delicious. What an excellent use of a failed experiment.